Holger Danske is not the only one starting to awaken. SIAD and a few other like minded groups are getting organised in Denmark. According to the SIAD Danish blog, a new alliance is being formed out of similar groups with one common theme. The counter-jihad movement. Anti-jihad Danmark (SIAD, Nationale Danskere, I Media, Frit DK og Frie Danske Nationalister) are organising their first demonstration in Aalborg in Northern Jutland on the 12th of May. The theme of the demo will concentrate on less control of citizens and more control over the gangs that run free in that area in particular, and Denmark in general. Despite the somewhat nationalistic names that some of these groups have, they are committed to fighting anything undemocratic. As Anders Gravers [the leader of SIAD] puts it, “all the ‘isms’.” Communism, Nazism, Fascism and Islamism. As usual, the Danes are way ahead of us. Go over to On the Wing and read the rest. This entry was posted in Uncategorized by Baron Bodissey. Bookmark the permalink. I really like SIAD’s blogg they don’t take prisoner. I especially like the picture of the Koran and the muslim toilet side by side with the comment, “pity they didn’t wipe their backside with it”, a sentiment I concur with. What really is a pity though is that so little of it is translated into English the no nonsense way it is written is so refreshing. 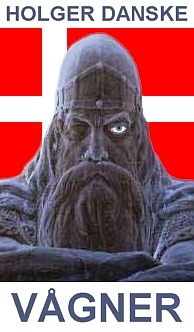 Holger Danske with one eye watching is the catchiest image I know. What a great idea. The red backing up the Norsk Cross is powerful. perhaps like the red in the ‘stars and stripes’. Almost makes me want to learn Danish…. Holger Danske is stirring. Holger Danske, the warrior, is stirring. Reminds me of ‘Last of the Mohicans’…. …perhaps Holger also is present in the council of his people. The ‘Last of the Warriors’, the men of courage…. or perhaps a new beginning. Why is the Norsk Cross on it’s side? Can someone answer this question for me? Yeah well he would be kind ticked that the new movie Pathfinder which has a quite fine bash at Vikings and hero worships American indians. It is when the call goes out for the Raven Banner that we shall know that Free Men remember the cost of Freedom, no matter the cost to themselves. I think it should be noted that Frie Danske Nationalister’s leader is the ex-spokesman of Dansk Front (The Danish Front). Dansk Front is a semi nazi orginisation in Denmark. But Julius Børgesen was kicked out of Dansk Front because he was charged by the police because he went to an anarchy forum and aired the idea of blowing up a ministers home, and he was also charged of possessing an assault rifle. Just to clarify the stance of Julius Børgensen – in connection to SIAD. Julius Børgesen is not in SIAD, but in a group associated to SIAD. It is true that Julius Børgesen has been charged with threaths, but it was a political charge – and highly suspect political charge. Julius is in no way Nazi, but is fighting for the democracy and freedom of Denmark. Julius has, as anyone associates to SIAD, signed a declaration personally testifying his dissociation to nazism, communism and Islamism. Absolutely no Nazis are connected to SIAD – this would be ridiculous, since we are fighting a nazilike system. People connected to SIAD are fighting for freedom no for autocratic suppression. SIAD would never allow any Nazis in its organization – and if a nazi made his way into the organization he would be excluded the minute SIAD found out. The fighters of SIAD are freedomfighters. But isn’t it true that true that during his time as a spokesman of Dansk Front, Julius Børgesen in no way took a stand and renounced nazism? Because of the fact that the orginisation he represented was filled with people, if not outright nazis, then sympathised with them. And he is a selfproclaimed racist. Even the brave Jews of Israel are considered Nazi-Racists today. These words are slowly but surely turning into compliments. As far as I know Julius Børgesen went to that anarchy forum, to try and see what he could get people to admit, it was right after there was a red facist attack on a minister. Then he is sent to jail, completly moronic. We should be thankfull, he still wants to fight for our country. The fact that the word racist (or nazi) has lost all meaning because of the fact that it is used extensively by the leftists to demonize anyone who either have an anti-immigrant stand or just have love for ones country, is just horrible; they don’t seem to get the fact that the word has lost all meaning and that people don’t even raise an eyebrow anymore when one is said to be racist, but when a true racist comes along, as is the case with Børgesen, the word racist means just that, he IS a racist, not just a guy who do not want a large influx of immigrants. But on the former forums of Dansk Front, before it was hacked by leftists, he would quite often post a comment and telling people how much he hated people with a different skin color. The point is, I applaud you guys’ effort of fighting islamo-fascism, I think it is a worthy cause, but be careful of whom you ally with. Well Julius Børgesen is NOT a racist – since he authorized the declaration that he is for democracy and freedom and against Islamofascism. To be a racist you should adhere to the Social Darwinist ideas behind Nazism – that different people are different races, fighting for supremacy. This is a ridiculous idea – nobody takes it serious anymore, and this includes Julius Børgesen. The way SIAD is connected to Julius Børgesen is through the network Antijihad Danmark. In Anti Jihad Danmark you are only allowed to participate if you fight the authoritative and suppressing systems of Nazism, Communism, and Islamism. And you fight for freedom through democracy. And Julius Børgesen put his name under a declaration proving just this. Frede I agree, that its a shame, those words have been rendered meaningless. But they have. As for “real” Racists and Nazis, I don’t consider them a big issue. Its not like our prisons are filled with Nazis or 70% of all violent crime incl. rapes are committed by Nazis. We don’t have huge unemployment problems within our Nazi-no go zones. We don’t constantly hear about Nazi groups demanding respect and special treatment. Forced Nazi-marriages hasn’t been a big issue lately. And if Julius Børgesen indeed left Nazism behind, it seems to have happened completely without any death threats. 70 Years ago the left was all about sucking up to the Nazis. Now after they are long gone, the left gets all brave and wants to fight them. Its much more convenient to fight tyranny after its gone. Fighting the tyranny that we have today is nasty stuff, I mean, they can fight back, just to name one rather unpleasant thing. The tyranny we face today is Islam and personally I always get happy, when I hear of someone who left Islam behind. Any freedom loving person should be happy, when someone leaves tyranny behind, be it Nazism, Communism, or Islamism. Then Børgesen must have made a serious U-turn of oppinions, if what you are saying is true. Because, following the muhammadcartoons, Dansk Front with Julius Børgesen, DNSB (The Danish NationalSocialist Movement) with Jonni Hansen met in february in Hillerød for an anti-immigrant demonstration, where they were shouting “Danmark for danskerne – udlændinge ud” (Denmark for the danes – immigrants out), followed by the members of DNSB raising their arms in salute. Børgesen didn’t have a problem with being seen with neo-nazis then. I have diffulty in seing Børgesen as an ally in this ’cause’ . Ordinary people, and especially(!) the media don’t forget easily, that Børgesen was the spokesman of Dansk Front, and Dansk Front is still being associated with nazis. But if Anders said Børgesen signed a decleration, then great. But he might just have another agenda, aside from fighting islams creeping dominance. The posting above is about Naser Khader and Demokratiske Muslimer. When the organisation was started, all the members signed a declaration saying that they reject Sharia. Some of them might not always have rejected Sharia. Would you say it is important to find out if they once supported Sharia, and then ask Demokratiske Muslimer to get rid of those members ? And if Demokratiske Muslimer refused to do this, would you think it discredits the organisation as a whole ? If you don’t consider yourself part of the left, why are you so eager to fight their battles and support an agenda of having Nazism to be seen as the greatest threat to our freedom ?. Don’t you realize that its a trick to take our mind away from the real problems we are faced with today?. Problems that when more people become aware of them, will crush the left, and they know it. We have members of Parliament who have been seen together with Islamists. Islamist like the late Abu Laban who are a real and serious problem for our Democratic country. And you worry about who was seen with Jonny Hansen and his 3 friends.